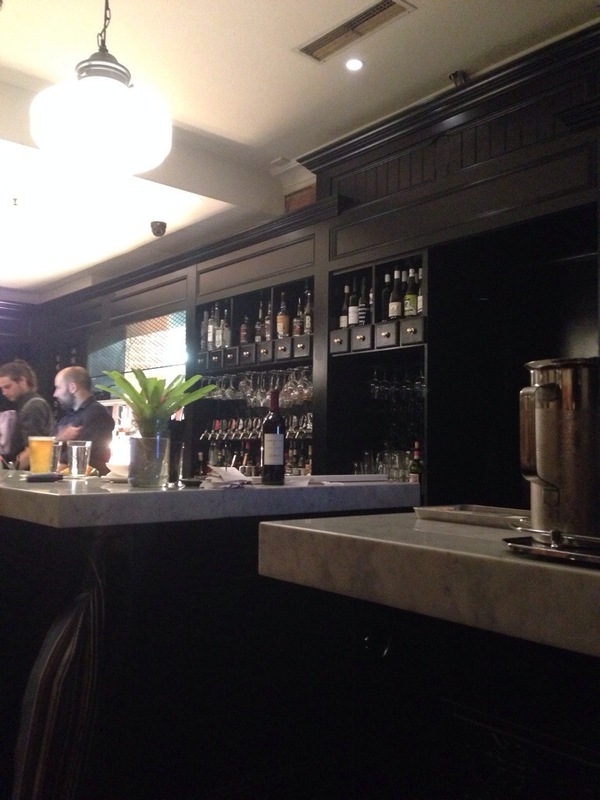 You’ll find Nieuw Amsterdam on Hardware st in the Melbourne CBD. They’re a bar and eatery with a one page menu and an entire book of drinks to choose from. There’s seating both up and downstairs and the decor a mix of dark woods and cool marble. The name is deceiving, Nieuw Amsterdam actually refers to a Dutch settlement on Manhattan Island and you’ll find the food here has an American flavour. The waiter who served us was both friendly and efficient and was great with running us through the menu. Nieuw Amsterdam is doing what everyone in Melbourne seems to be right now and offering a majority tapas menu with only a few difficult to share dishes. Starving from the flight over from Perth and with bodies confused by the 2 hour jump forward we went for a large selection of foods, we were warned that it was a lot, but we pushed ahead regardless. First to come to the table was a refreshing kingfish ceviche. 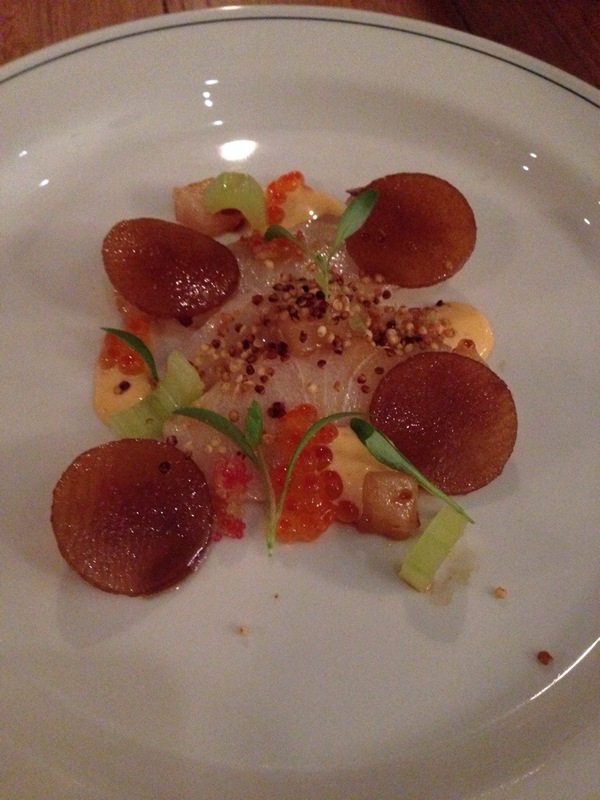 The flavours were light and nuanced, it wasn’t overly fishy, and the roe had that delicate pop as you bite down. This dish was a great way to start our meal. 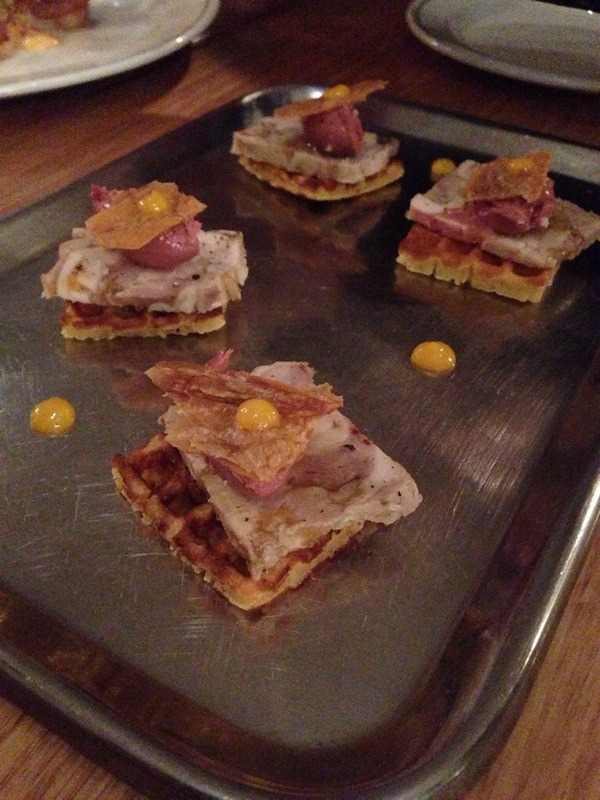 Next up we had the chicken waffles served with a crisp and pate. Chicken and waffles is always a great combination and though the flavours were rich thanks to the pate the serving was small enough to enjoy without becoming overwhelming. Sometimes there’s something special in a meal, a plate, a mouthful even, where up you lose yourself in the flavour. 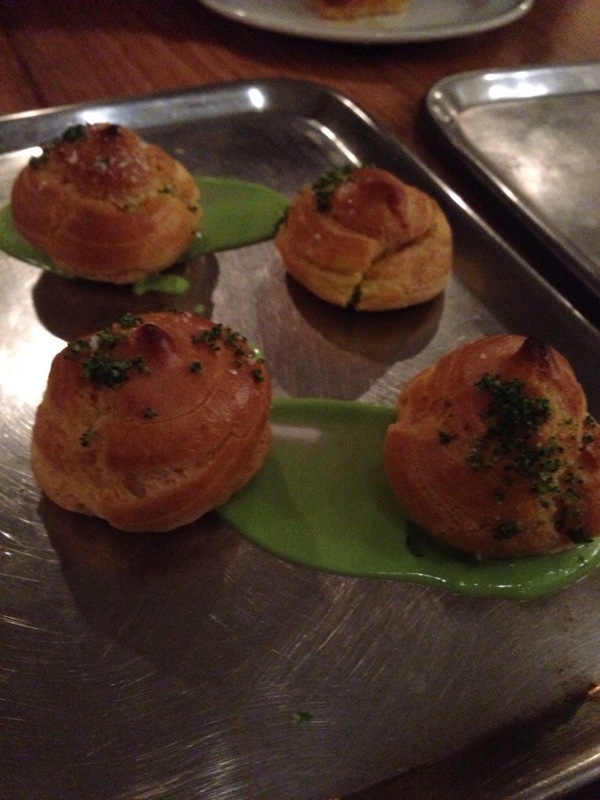 For me this came in the very first bite of the broccoli and goats curd profiterole. Something about it just made me feel at home, it was so creamy, with crumbly short pastry, a hint of broccoli and that bite from the curd. Just heavenly. 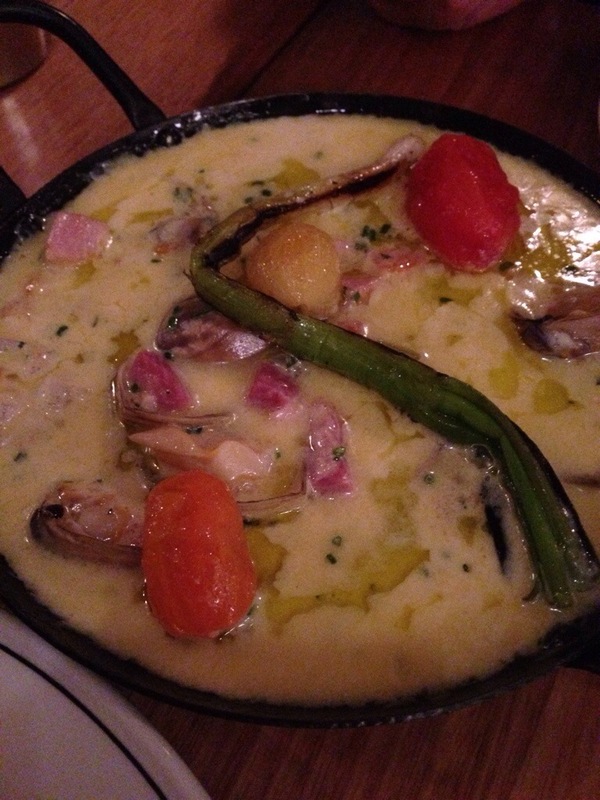 The first of our main meals, and the most difficult to share was a rich and creamy clam chowder. This was our favourite dish of the evening, it really packed a punch and was so morish we kept going back for more and more, dribbling drops across the table in the way to our mouths. We finished every little bit of it, mopping up all the juices with bread and consuming every last clam. Please don’t leave Nieuw Amsterdam without trying it! A dish that didn’t quite hit the mark though was the Grits Fritters. 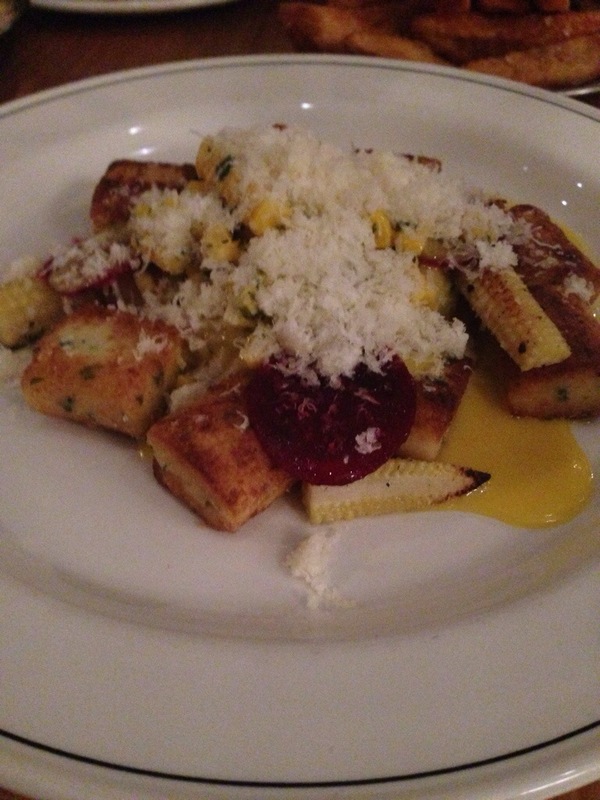 It came with grated cheese, sweet corn, zucchini and beetroot and though it was nice it just didn’t hit as hard as the chowder had and was almost a touch too sweet. There wasn’t much in the way of contrasting textures, everything was so soft and we felt like something was necessary to bump it up to the sky high standards of our previous dishes. 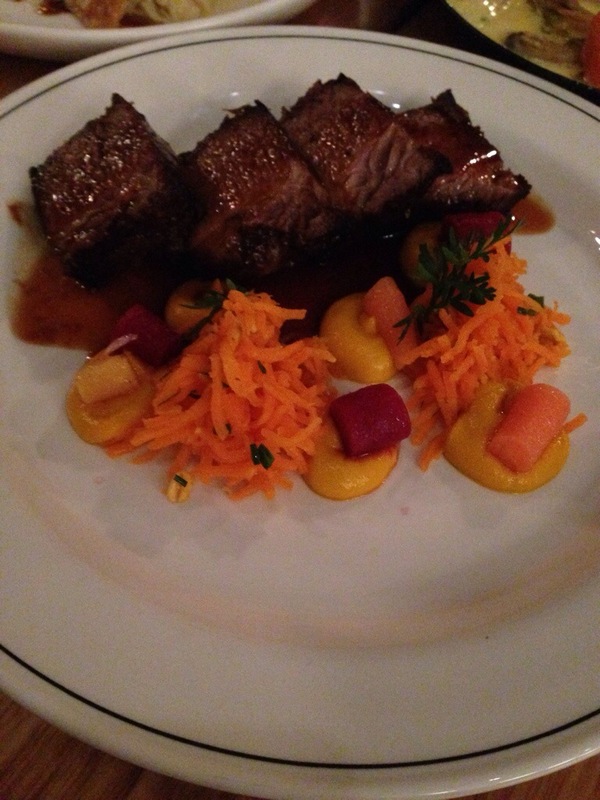 We also tried the Smokey Beef Brisket with carrot done a few ways. There was a nice carrot purée and a sort of spiced honey carrot which we really enjoyed. The brisket was tender and had loads of flavour with a crispy, spiced skin. 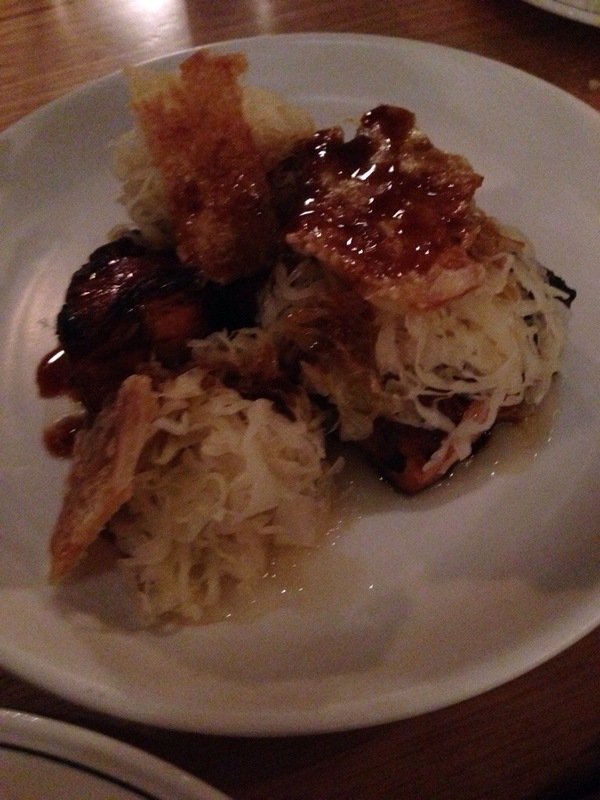 Finally we had Southern Style Pork Belly Chops with sauerkraut, apple sauce and crackling. They did cheat a little by serving the crackling separate but it was done well. Apparently what made it Southern was the herb and spice rub. The pork was just so tender and juicy, and he apple purée subtle but delicious nonetheless. We found the sauerkraut to be a bit too overwhelming and could have gone for much less of it on the plate. The service had been excellent up until this point but there was quite a wait for the table to be cleared, to hey dessert menus and then have our order taken. Luckily though the desserts were completely worth the wait! We started with peanut butter waffles with a salted peanut caramel, tempered chocolate and a raspberry sorbet. With such indulgent and heavy ingredients the raspberry sorbet provided a nice means to cut through the richness. 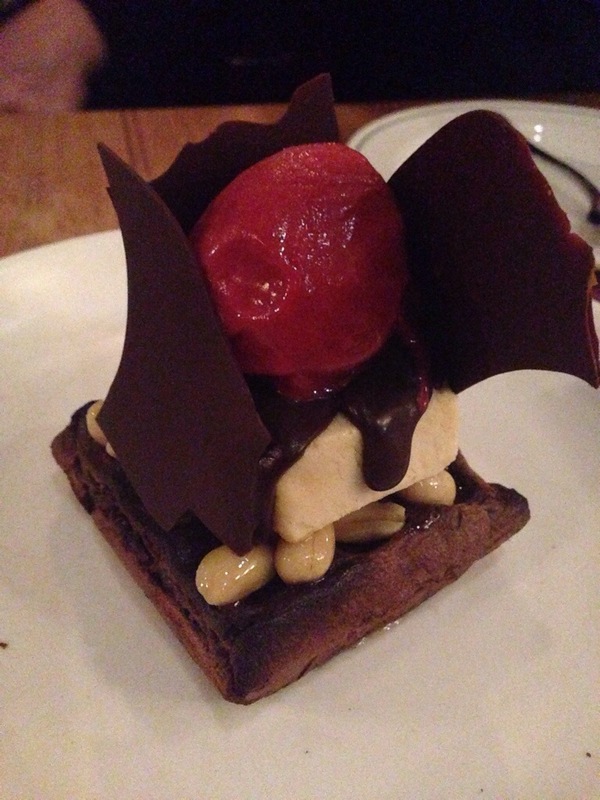 There’s not much you can say about a dessert like this, it certainly tasted as good as it looked! 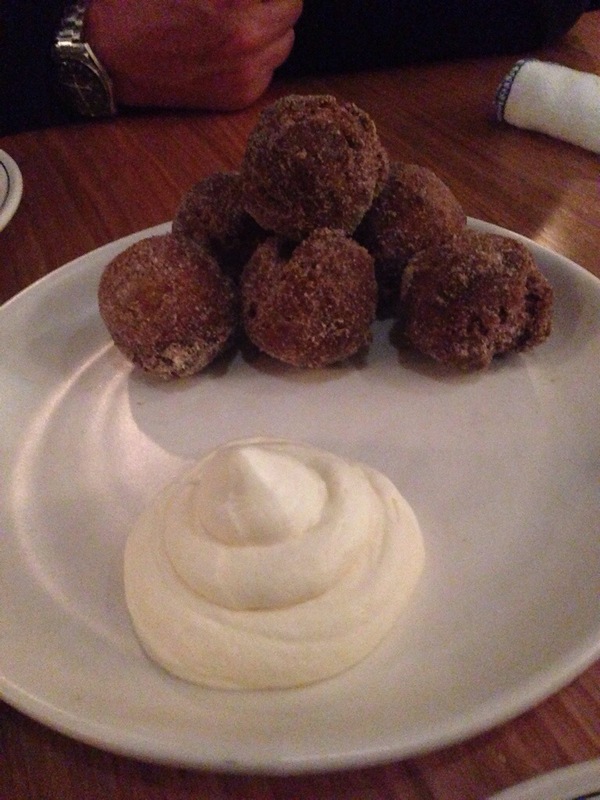 We also went for the pumpkin donuts. The donuts were great, crispy outside and liberally coated with sugar. There wasn’t really a pumpkin flavour, but there was a touch of spice and it gave a little thicker texture. The Kentucky bourbon cream was pretty delicious too, perfect for some donut dunking. We were really impressed with Nieuw Amsterdam. This was a small and refined menu that that just a works and we left satisfied and happy diners! Just went here last Friday. Loved the clam chowder as well.